Crews's first book in five years is a departure for this gifted author/artist, and a truly joyous celebration. In his dynamic tale of family togetherness, an African American man recalls boyhood summers spent at his grandmother's rural home in Florida. 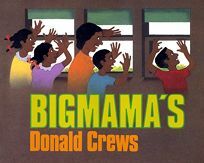 Each year the vacation began with an adventurous three-day train ride to Bigmama's (``Not that she was big, but she was Mama's mama'') in Cottondale. The hot, hazy months that followed were filled with relatives, fishing and good times. A backyard coop ``where Sunday dinner's chicken spent its last days,'' the barn and pond all begged to be explored by rambunctious visitors. Even the stars shone brighter in the night sky at this wondrous place. Like the title character so lovingly depicted within, the book's jacket is warm and enticing--vibrant, boldly outlined letters draw readers into a fragrant slice of Americana. Crews's rich earth tones perfectly portray the rustic life of this bygone era, while the lanky, barefoot children embody the relaxed--and utterly relaxing--freedom of summer. In the manner of exemplary works for children, Bigmama's works splendidly on more than one level. The evocative text provides plenty of action to interest younger readers and--for their parents--the nostalgic tone cannot fail to lovingly recall carefree days long past. Reality, in the form of a present-day metropolis viewed through a window, brings the story to an appropriate close, as the narrator, older and bearded, ``even now'' longs to recapture the essence of enchantment that was found at Bigmama's. Ages 4-up. (Oct.) .